As expected, the GTS 450 dominates the tessellation battle especially in extreme and insane modes. Even with one GPC, Nvidia’s architecture seems to be quite more capable than ATI’s, when more than needed triangles, appear on a scene. I also saw some Lost Planet 2 benchies, which showed like 50% more perf for the 450. I wonder how this came to be. If I am not greatly mistaken, from Juniper and above, all Evergreen chips have the same tesselation capabilities. I wonder why the 5770 is still slower than a 1 GPC Fermi based card. GF106 although being on par with Juniper about triangle setup, is still able to process the attribute subdivision in parallel, thanks to distributed tessellation engine. 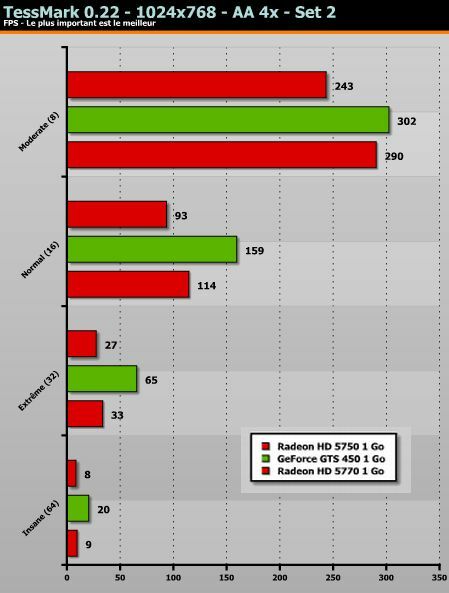 And on top of that, AMD’s OGL4 driver is still lagging behind in terms of performance. so which is better the gtc 450 superclocked or the 5770? i just got the gts 450 and i seem partial to it. let me know your thoughts! I’ve added a HD5770 to the linked comparison at GPU-tech.org. Tessellation performance doesn’t depend very much on the number of GPCs but on the number of SMs in Nvidia cards. The GPC stuff is only responsible for (distributed) rasterization. Having looked at a shipload of benchmarks in the past few weeks, I’ve noticed that Crysis is NOT a good tool for comparison, however popular it might be. It often goes against the trend, when all other games see no difference between cards/processors/motherboards or see a difference in the opposite direction. In every case it seems to favor AMD/ATI over Intel/Nvidia. Hmmm…I wonder why that would be, considering that AMD and ATI are the same company? And frankly Crysis seems to be more popular as a framerates gauge than it is as a game. It isn’t on Gamespot’s top 15, yet it seems to pop up in every review, simply because it puts an (artificially?) high load on GPU bandwidth. I am not saying that AMD paid EA to add code to the game that would favor one platform over another, but it is not beyond the realm of possibility. IMnsHO, of course. You must be trolling, because it’s almost common knowledge in the PC world that nvidia payed to have crysis work better with their products. Well what should i buy a GTS450 or MSI r5770 HAWK?? 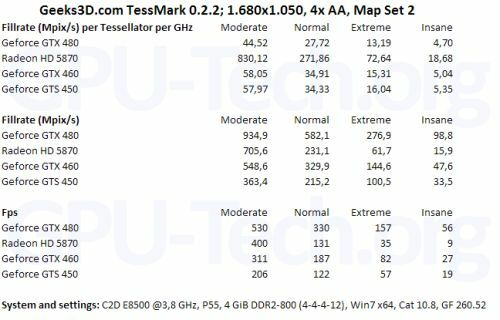 is tessellation really worth the performance diff b/w GTS450 and HD 5770 ? can we really play games at 1080p using tessellation with a GTS450?